Where to buy Novarnica products? The ailments associated with sore joints, inflammation and bone deterioration such as arthritis, rheumatism and osteoarthritis may be common in our entourage. They do not only affect the elderly or sedentary. Here are some definitions to better understand the differences between them. OSTEOARTHRITIS: defines this chronic disorder (> 3 months) that is solely cartilage-degenerative. It is non inflammatory, with a major genetic component and leads to the destruction of the cartilage and dysfunction of the joint. Osteoarthritis occurs following mechanical and biological phenomena and produces an imbalance between the production and the destruction of cartilage. This becomes predominant and lesions appear within the cartilage. This is commonly called “chondropathy” (chondro = cartilage and pathy = disease). Osteoarthritis is not synonymous with ageing. They are effectively two different mechanisms even though they are often associated with one another: osteoarthritis is a real disease and not the inevitable effect of ageing. Ageing alone is not sufficient to bring about the onset of osteoarthritis. However, it is certain that it is responsible for the cartilage having less resistance to various injuries and thus promotes the onset of osteoarthritis. Knee osteoarthritis is 3 times more common than hip osteoarthritis. 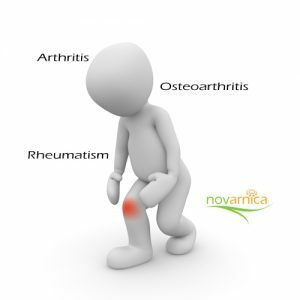 Novarnica products can help you relieve the pain associated with sore joints and arthritis.